Old rivalries, new faces and some very brightly coloured cars... Formula 1 is back for another season of high drama. As the teams undertake a second round of tweaks and tinkering in Barcelona, we thought we would get some early predictions in. Wherever the podium is, who do you think will be lifting the drivers' and constructors' championship titles? Will the Hamilton-Mercedes juggernaut triumph once again? Can Vettel and Ferrari's campaign go the distance? Or could Red Bull and McLaren mount a serious challenge to the front of the grid? Also, as an added bonus, give us your pick for the unfortunate soul who will finish bottom of class in 2018. Predict your winners and sinners from the lists below. Who will win the 2018 F1 title? Pick your top three drivers for the 2018 Formula 1 season. Which F1 team will triumph in 2018? Pick your top three teams for the 2018 Formula 1 season. Who will finish the F1 season last? Pick the driver you think will finish last for the 2018 Formula 1 season. Which team will finish last in 2018? 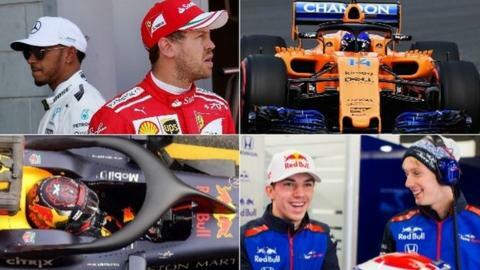 Pick which team you think will finish last for the 2018 Formula 1 season.